Southworth Sailor: Our classroom makes the Newspaper! Unfortunately, our notoriety is at the expense of our stolen equipment. 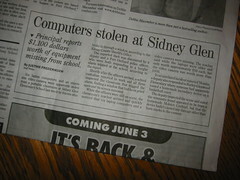 As I reported in an earlier blog, six older mac laptops and a video camera were stolen from our classroom. One of the students saw this article in the paper and brought it in for share. I'm still a little bummed about the incident, as those laptops were being used quite a bit by the students. They miss them. At least the news article will buy us a little sympathy; and you never know when sympathy may come in handy! --- We watched the ending of the national spelling bee in class. I don't think that I could spell any of the words that were given. Many of the contestants are returning from previous years. The winner was Anurag Kashyap from California. We were amazed how many of the finalist were of East Indian decent.